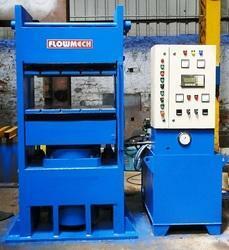 We offer Customers Hydraulic Molding Presses maximum upto 1500 Tons, as per customer requirements. These presses are precision made using tested materials with press frame made out of tested MS Plates that are stress relieved after fabrication and machined for better accuracy. We are the leading manufacturer, supplier and exporter of Fully automatic two station three station and four station PLC control rubber molding presses. Manufactured by us with common power pack have advance technique of auto degassing/ air breathing that helps in increasing production, improve quality & save manpower, save electric power, rejection time and space. 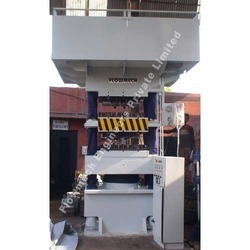 We are the leading manufacturer and exporter of Hydraulic Solid Tyre Moulding Presses. 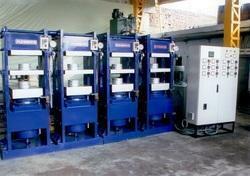 We hold expertise in designing and supplying an array of solid tyre molding press. 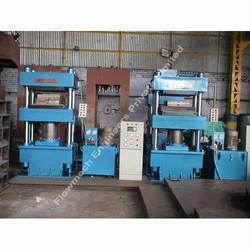 These heavy duty four pillars type hydraulic presses are used in multitude of industries across the globe. These also feature PLC, MMI as well as specially designed low noise hydraulic power pads with cartridge valve for achieving smooth change over of valves and PLC & MMI for automation of hydraulic press cycle. Its four pillar support moving bolster with gun metal bushes with perfect system of achieving automatic centralized lubrication. The Press Can Be Designed Pillar / Gate Type / H-Frame Type. We are the leading manufacturer and exporter of quality hydraulic Melamine Moulding presses for diverse industries. Our custom design hydraulic presses based on the client's specifications. "Flowmech" offers a wide range of supreme quality hydraulic presses for Melamine Crockery that is used to generate a compressive fornce. These Hot Moulding especially designed for melamine are highly rigid, compact and space saving, bigger ram dia gives uniform pressure on the working platen which increase the quality and productivity of the product. 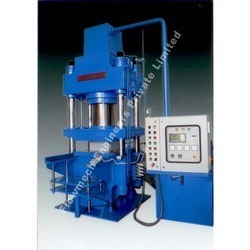 We are the leading manufacturer and exporter of Hydraulic Hot Presses. We can offer customers Hot Molding Press For Brake Lining that are specially designed for delivering optimum production of simple as well as intricate hot molding of brake lining components with ejection facility. These hydraulic hot molding presses have soft opening immediately after turning period so as to minimize any jerky movement that may cause damages to components being molded. 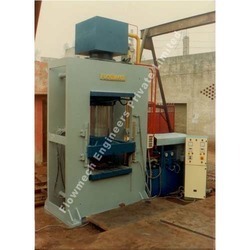 We can also manufacture hydraulic hot molding press as per customer's given requirements. 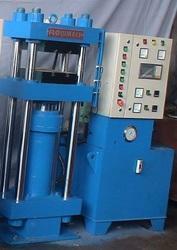 We are the leading manufacturer and exporter of Hydraulic Compression Moulding Presses. Backed by team of skilled professionals, we are successfully fabricating most efficient compression molding presses with four-pillar type construction. These provide perfect guiding of moving bolster for achieving better performance. 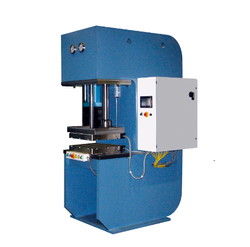 Further, these molding presses have compact design, single body as well as easy operating systems. Other than this, its features include long slide guide with lubrication system for better accuracy. This makes the press suitable for molding of urea, rubber fiber, melamine etc. We are leading manufacturers and exporter of hydraulic transfer molding presses. These can be specifically designed for optimum production of simple as well as intricate transfer molding of molded components. The Press Will Be Available In Pillar Type/Gate Type/H-Frame Type. We the leading manufacturer and exporter of HydraulicVacuum molding press as per customer specification. Our vacuum compression molding presses are great in quality, highly efficient, reliable and durable. Delivering optimum functionality standards, these are made available in different configurations. Further, we can also custom deliver these in specifications as demanded by the customers. 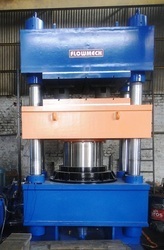 We are the leading manufacturer and exporter of Hydraulic Hot Moulding Press. Our range of Hydraulic Hot Molding Presses are precision fabricated for hot molding of carbon powder for pallets, brake lining, brake shoes, briquettes, disk pads and others. These presses are rigid, compact as well as high on speed and are mainly designed for Brake Lining Industries. These Hydraulic Molding Press are also simple as well as easy to install and incorporate latest technology so as to provide effective operations. We are the leading manufacturer and exporter of Hydraulic SMC Moulding Press in all over the world. We offer customers Hydraulic SMC Molding Press that are precision designed for achieving optimum production of simple as well as intricate molding of Bakelite, Malamine, DMC/ SMC with ejection facility. These SMC Molding Press can also be availed in fully automatic as well as semi -automatic models. The soft opening just after turning point also helps in avoiding jerk movements. We can also make these available with electric heaters & control panels backed by digital temperature controller. These SMC Molding Press and Hydraulic SMC Molding Press are highly productive, durable & can also be availed in capacities ranging from 30 ton to 4000 ton as per customer's requirements. We are a prominent manufacturer, supplier and trader of a comprehensive assortment of Hydraulic Presses. 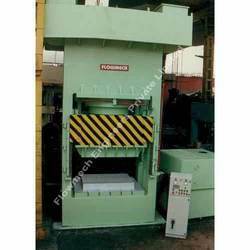 This range of presses is manufactured using high grade material, which are sourced from reputed market vendors. In addition to this, these 250 ton presses are manufactured in sync with international quality standards. Clients can avail these products in varied specifications as per their specific requirements. Electrical Motor 1 No. 10 H.P. Looking for Hydraulic Molding Presses ?